We have shown that nanoparticle inhalation impairs endothelium-dependent vasodilation in coronary arterioles. It is unknown whether local reactive oxygen species (ROS) contribute to this effect. Rats were exposed to TiO2 nanoparticles via inhalation to produce a pulmonary deposition of 10 μg. Coronary arterioles were isolated from the left anterior descending artery distribution, and responses to acetylcholine, arachidonic acid, and U46619 were assessed. Contributions of nitric oxide synthase and prostaglandin were assessed via competitive inhibition with NG-Monomethyl-L-Arginine (L-NMMA) and indomethacin. Microvascular wall ROS were quantified via dihydroethidium (DHE) fluorescence. Coronary arterioles from rats exposed to nano-TiO2 exhibited an attenuated vasodilator response to ACh, and this coincided with a 45% increase in DHE fluorescence. Coincubation with 2,2,6,6-tetramethylpiperidine-N-oxyl and catalase ameliorated impairments in ACh-induced vasodilation from nanoparticle exposed rats. Incubation with either L-NMMA or indomethacin significantly attenuated ACh-induced vasodilation in sham-control rats, but had no effect in rats exposed to nano-TiO2. 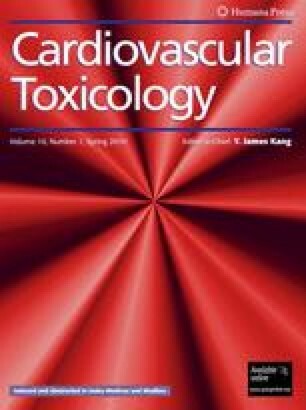 Arachidonic acid induced vasoconstriction in coronary arterioles from rats exposed to nano-TiO2, but dilated arterioles from sham-control rats. These results suggest that nanoparticle exposure significantly impairs endothelium-dependent vasoreactivity in coronary arterioles, and this may be due in large part to increases in microvascular ROS. Furthermore, altered prostanoid formation may also contribute to this dysfunction. Such disturbances in coronary microvascular function may contribute to the cardiac events associated with exposure to particles in this size range. The authors thank Carroll McBride and Kimberly Wix for their expert technical assistance in this study, and Travis Knuckles, Ph.D., for his help in reviewing this manuscript. This work was supported by the National Institutes of Health/National Institute for Environmental Health Sciences [grant numbers R01-ES015022 and RC1 ES018274 (to TRN)].